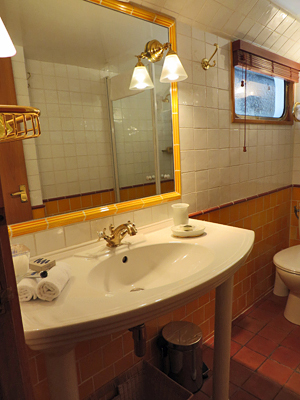 BELMOND NAPOLEON is the height of elegance in river barge cruising on the Rhone River. Each daily excursion is a highlight visiting some of the best sights of Provence. 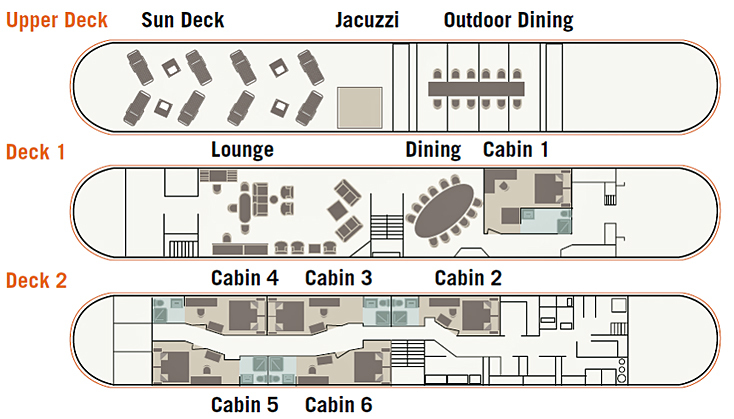 The spacious salon and dining room of the Ultra Deluxe Class Napoleon are decorated in warm provencal colors, and it has a large observation deck with lounge chairs and hot tub. 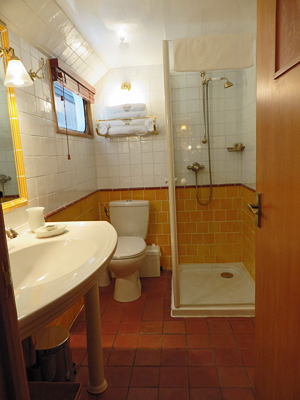 The inviting staterooms with ensuite baths each have a TV and DVD. 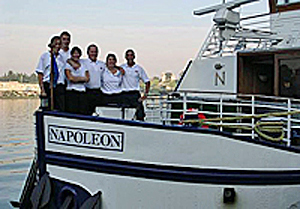 Known for its excellent cuisine and interesting excursions, a river barge cruise on Napoleon is la creme de la creme. The experienced crew of six cares for your every wish, and makes this unique experience a special treat for everyone. This cruise is ideal for those wanting to immerse themselves in the food, wine, and culture of luminescent Provence. Transportation between Paris and the barge is included. Cruising Region: Rhone River between Tain L'Hermitage and Arles, Saone River on select weeks. Transportation between Paris and the barge by first class TGV train which tickets are booked for the specific first and last dates of your barge cruise and are non-changeable or refundable. 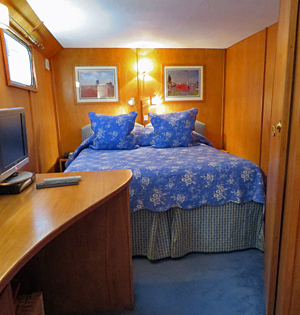 All barge amenities including bicycles, Jacuzzi on deck, music system, library, etc. A champagne reception gives you a chance to meet the crew. A late afternoon cruise from Vallabrègues to Arles is your first taste of Rhône River cruising. After dinner, take a walking tour of Arles, famous for it's Roman ruins and also where Van Gogh spent much of 1888 and '89 painting. Today, visit a traditional 18th century "Provencal Bastide" in St. Rémy for an olive oil tasting. Lunch on-board. Relax during the afternoon cruise to Avignon and watch the scenery of the Rhône Valley drift by. Cruise past Le Pont St. Bénézet (the famous Pont d'Avignon) before mooring-up at the quay facing the gate to the walled city. Visit the Pont du Gard, part of the Roman aqueduct that transported spring water from Uzès to Nîmes. Return to the boat for drinks on the deck, followed by a wonderful dinner. A walking tour introduces you to the walled city of Avignon, home of the Popes from 1309-77. A guided tour of the Palace of the Popes is followed by free time to enjoy some shopping or perhaps, to take a drink in a pavement café and watch the world go by. Return to the barge where lunch awaits and an afternoon cruise. Visit the world famous Châteauneuf du Pape,summer home of the popes from Avignon, for a wine tasting before continuing your cruise to the small village of St. Etienne des Sorts. This morning your guide takes you on a tour of Orange, an important Roman city dating back to 100 BC. The historical town contains two of the finest Roman monuments in Europe. Lunch back on board and continue the cruise to the mooring at Viviers. This afternoon we pass through the lock of Bollene, one of the largest locks (Ecluse) in Europe with a drop of approximately 23 metres. There's time for a leisurely stroll around this charming medieval town. Today's visit is to the typical Provencal village of Nyons, set up high in the hills, to visit a working lavender distillery and tour an ancient XVIII century olive mill. Lunch is taken at a local restaurant in the very scenic village of Grignan, filled with small alley ways, famous for it's wild roses and with a medieval Château at the top of the town. In the afternoon, visit a truffle farm to learn all about the black diamond and taste this expensive and unusual mushroom. Rejoin the boat at La Pouzin, to continue the cruise to La Volte. This morning, the chef walks you over to discover a traditional French market in La Voulte where you have the chance to pick out some local produce to enjoy back on board during a leisurely lunch. During this part of the cruise the river valley is flanked by the vineyards of the Côte du Rhône and has a completely different perspective. 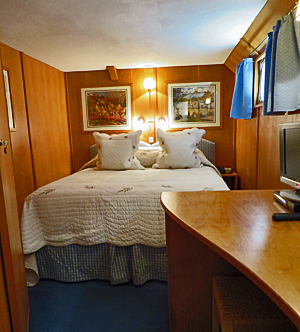 Mooring in Tain or Tournon you are escorted to Mr Ferraton's winery for your last dégustation. We enjoy a private tour and wine tasting just minutes from the boat. Meanwhile the chef is busy back on the boat preparing a Farewell gala dinner. After breakfast disembark the Napoleon for your onward travel arrangements. "Cruising seems to me a lot like going to a great spa. You don't have to make any decisions at all and all your needs are taken care of! We loved the crew and the elegant dinners. Beth, your service was outstanding with your attention to detail. I'm so glad I found you." 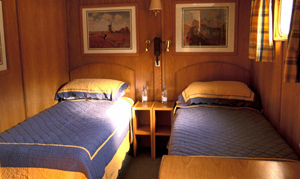 Sue and Alan C.
"The barge and crew were just fabulous in every aspect and the accommodations outstanding! It absolutely met our expectations and more. On the excursions, we learned so much and loved the opportunity to keep up our fitness and walk off some of the cheese. The best was the food, glorious food, and after this the Van Gogh and different experiences off the barge. Graham really loved the wine cellars. We least liked having to leave at the end of the week!" Robyn and Graham K.